Now, if you haven’t spent time in the Philippines during Christmas, it’s a pretty phenomenal experience. You would be hard pressed to find a place that feels more like a ‘Winter Wonderland’ full of holiday spirit than the Philippines. And this is a country that has never seen snow. Christmas carols can be heard on nearly every street corner, everyone greets each other with ‘Merry Christmas!’, and a real sense of positive energy and excitement can be felt wherever you go. It sounds really Norman Rockwell idealistic, I get it, but it’s the real thing and it is pretty remarkable to experience. 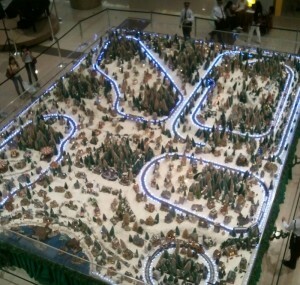 So hence, *really* big Christmas Villages at the mall. I think the Christmas Village concept isn’t an accident. I think the concept is less about building tiny houses with fake snow, little trains and powdered pine trees, and more about representing something that we all long for during Christmastime, a sense of togetherness, of bonding, of community and family and a sense of bigger unity, and being part of something ‘beyond ourselves’. Ah… too much eggnog for you Mr. Bill you may be thinking, but do a quick search on the Web and you’ll find that these villages started with Nativity scenes (yes, that part of Christmas we sometimes forget!). But they grew over time: as early as the 19th century, nativity scenes started adding townspeople and small representations of local buildings. Many believe that the tradition of building miniature Christmas village landscapes, including houses, animals and other hand-crafted wooden figures, began with the Pennsylvania Dutch in the late 1800s. In Provence, nativities have long been adding figures representing nearly every member of the community. In many homes, the village took more time and energy than the decoration of the family Christmas tree. Trust me, there’s more here than just a tiny miniaturization of some dreamy Christmas village. My Christmas wish for all of you is that you may be filled with the spirit of community, teamwork, and selflessness. It makes a difference to those around you, and if we all improve just a little in this area, it will make a difference to the broader world. The next time you see a Christmas Village, I hope that you will think about what it means a little more deeply. To see the We from the Me. 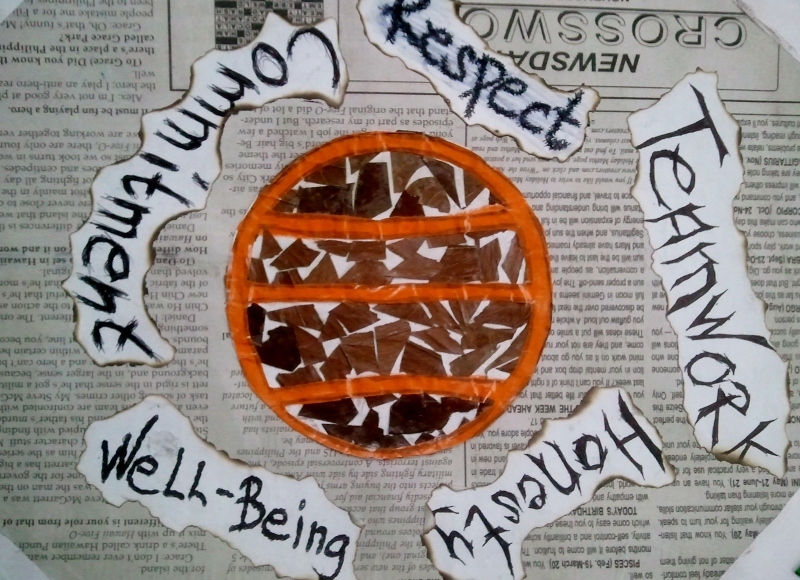 I’ll leave you with a page from one of the scrapbooks from our 2011 High Five Hope tournament, made by the street children in our program, showing the core values of High Five Hope.